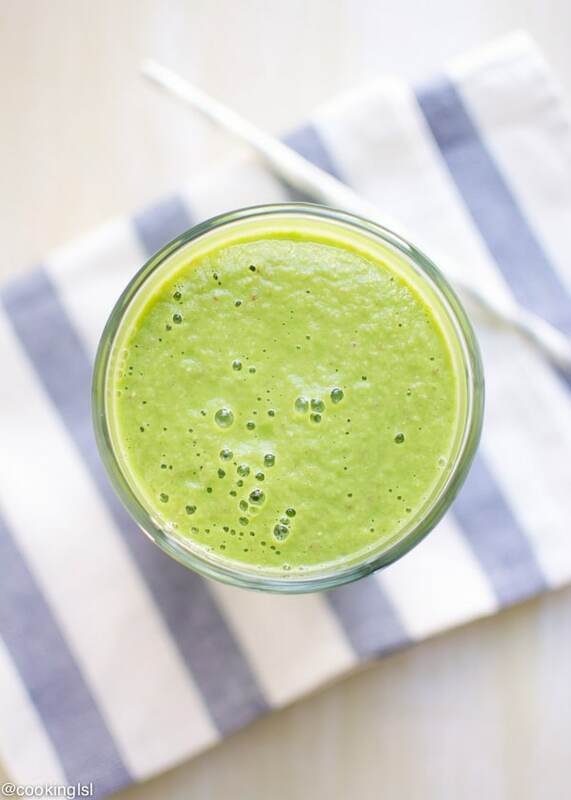 This apple pear green smoothie (green thickie) is fresh, delicious and nutritious. The combination of apple, pear, spinach, milk, rolled oats and pecans makes a thick and filling drink, that can easily replace a light meal. As I’ve mentioned before, I’m terrible with breakfast. Most days I get up early and don’t eat anything for at least 2 hours after that. I’m aware this is absolutely wrong, but I just don’t feel hungry. Well, this practice has lead to some stomach issues lately and I got a little scared. I started having breakfast regularly and I make sure I always have some kind of baked goods like muffins in the fridge (yes, I keep them in the fridge). I’ve also been using my Blendtec a lot lately. Mainly for smoothies, because it makes the creamiest, frothiest smoothies in less then a minute. Not a huge fan of green smoothies, especially the color (Shrek green) and the fact that some of them aren’t sweet enough for me, I decided to experiment and make a smoothie I can actually drink in the morning. Don’t worry, this is not the boring green smoothie with weird taste, I only use spinach as green element and it tastes wonderful! And since it is fall (almost winter, if you ask me… Chicago) I used some seasonal fruits like apple and pear in this smoothie. Pear is what makes it thick and sweet. I did not peel them, since their skins contain natural antioxidants, that most of us actually need. 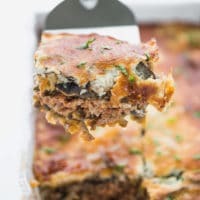 You can of course add nuts of your choice, I used pecans, just because I’ve love them and they are my favorite just for fall. The addition of rolled oats makes this apple pear green smoothie even thicker and adds a great nutritional boost. 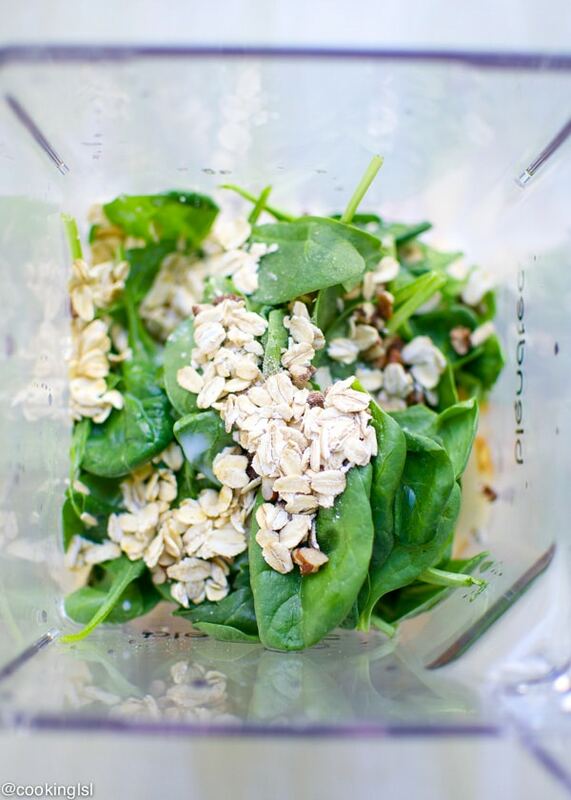 Oats blend in easily with the milk, fruits and spinach, if you use a powerful blender. 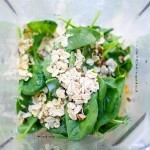 If your blender isn’t very good at grinding oats, you can grind them in a food processor before adding to the smoothie. I recently stumbled upon an article about “green thickies“. It stated that: green smoothies are drinks made from fruits and leafy greens. Green thickness are types of green smoothies. They are more filling, meal replacement smoothies, containing extra carbs, protein and healthy fats. 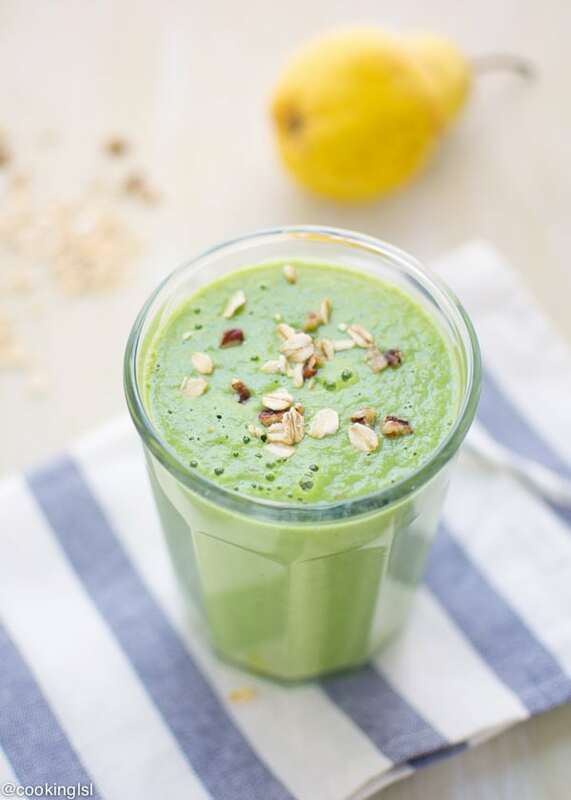 This apple pear green smoothie is more on the thick side and with the addition of oats and nuts (protein can definitely improve your health and boost your energy throughout the day. Can I call it a “thickie” ? And the best part – it only takes 2 minutes to make! 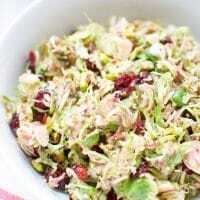 and sign up for e-mail updates, to receive more recipes (link in the sidebar). 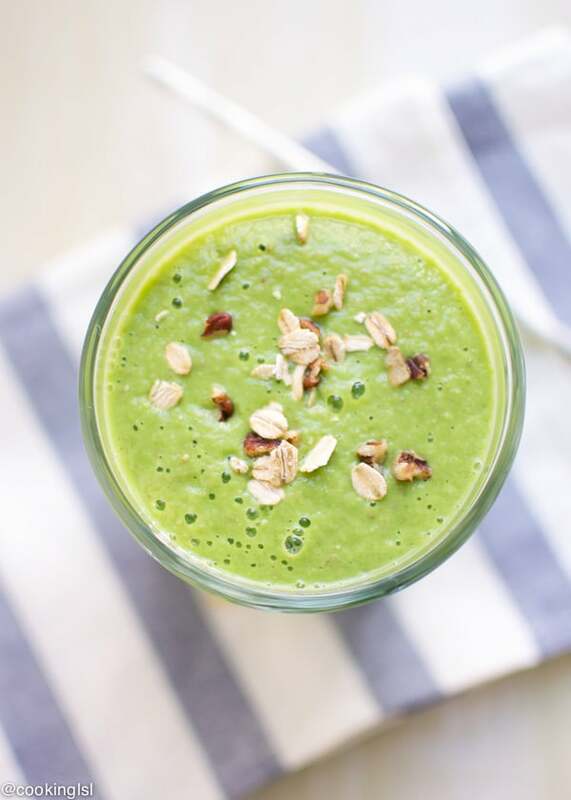 This apple pear green smoothie (green thickie) is fresh, delicious and nutritious. The combination of apple, pear, spinach, milk, rolled oats and pecans makes a filling drink, that can easily replace a light meal. Place all ingredients together in a powerful blender and blend until smooth. Pour in a glass, top with some more nuts (optional) and enjoy. I did not peel the apple or pear. You can use nuts of your choice. 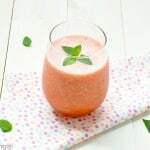 For a smoothie-like consistency use ice and for a juice-like consistency use water. Dairy milk could be substituted. I would have to make this without the pear, as I am really not a fan. I think it is the texture. It should be fine without the pear Dannii 🙂 Maybe more apple or you can add banana? I’m a bit like you, Mira … I find it really hard to eat breakfast as soon as I get up. Oats are OK, though, so I think this would go down OK. I’m sure I’d feel very smug as well as it’s so healthy. P.S. Hmmm … like the idea of having those muffins in the fridge for snack-time ’emergencies’! A thick apple smoothie – YAY!! Do you know I was at the fruit juice bar yesterday asking what apple smoothies they had?? None appealed to me because they just had juices in them. Now THIS is a meal in my books! Being so hot over here, it is perfect to have for breakfast instead of slaving over the stove. Thanks Mira! I hope your kids like it Laura! I agree Valya!Thanks a lot! I’m not the best with having breakfast, either! It’s usually just coffee or yogurt during the week. I love that you created a tasty green smoothie, Mira! I’ve always been a little hesitant to try a green one, but I love the apple and pear combo. Looks delicious! Pinned! This looks delicious! I love starting the morning with a green smoothie and yours sounds delicious!! 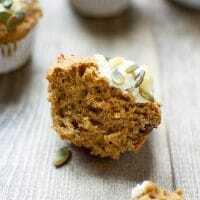 Love that you added oats and and pecans to make this a thickie. This is such a perfect way to start off the day on the right foot! I am just like you, Mira. I am at that stage when I am forcing myself to actually have a proper breakfast. I will give your smoothie a try this week, love pears. Pinned! Hey Oana, I’m really forcing myself to have breakfast most of the time! I hope you like that smoothie! 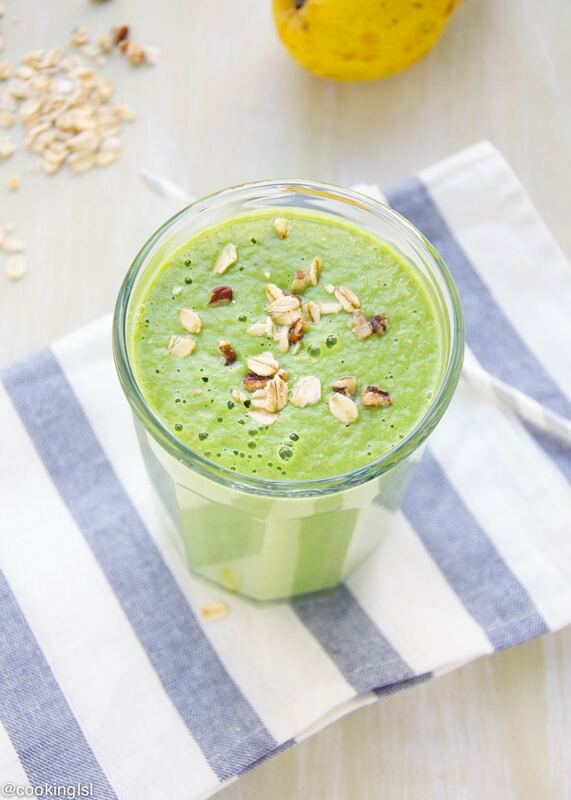 Is it weird that my mouth is watering over this delicious looking green smoothie? It looks seriously YUMMY and honestly like the perfect start to the day! 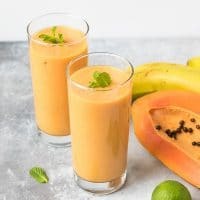 I find smoothies make the best breakfast because they are so fast and ready to go Hope your stomach issues get better!! I love the color of green smoothies! Reminds me of fresh grass in the spring. This is a great way to get your fruit and veggie servings in. Can’t wait to try this breakfast in a glass. Thanks Linda! I hope you like it! 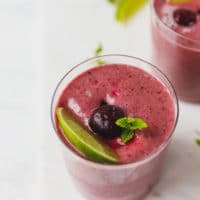 Smoothies are one of my very favorite breakfast treats! 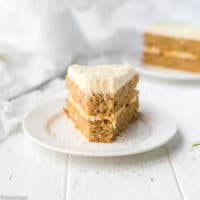 There are so many fabulous combinations, and they aren’t overly sweet – which I completely love! Thanks for a great idea!